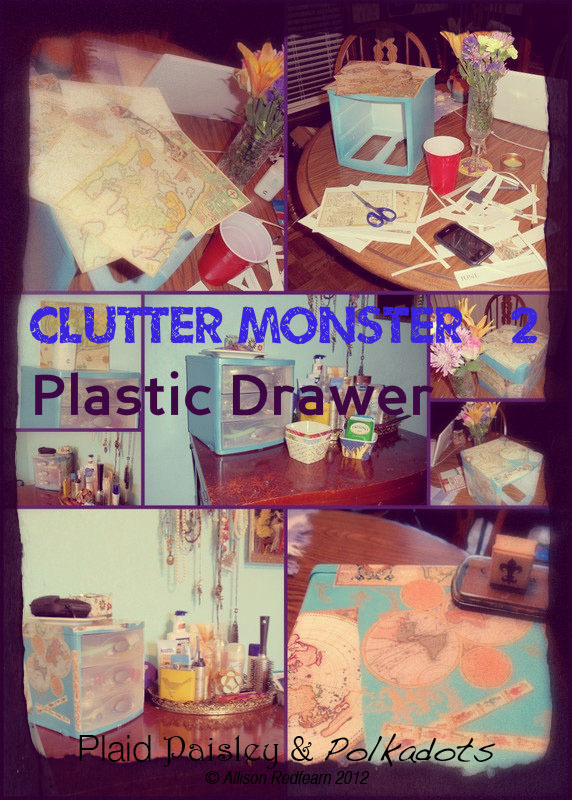 For this second installment of the Clutter Monster feature is a decoupage face-lift of a ready-made organizing gem: a tabletop plastic drawer. 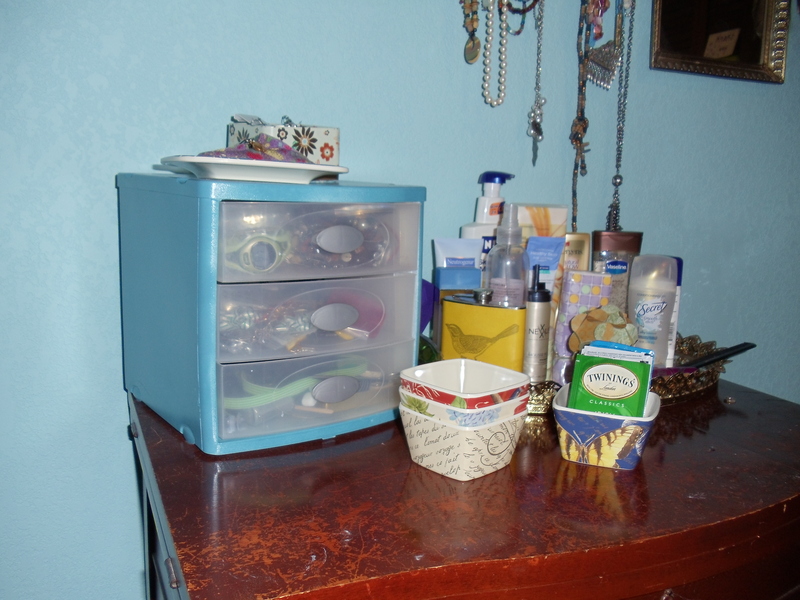 These little plastic drawers are just perfect for organizing desks, craft spaces, and jewelry spaces, but their major drawback is the garish white plastic blob they leave on the the table. 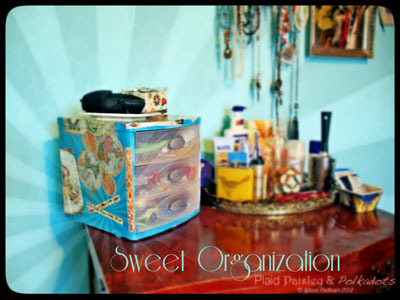 At first I tried to spray paint it, but that didn’t quite fix the problem so I have decided to use this as an opportunity to show you how the traditional craft of decoupage can liven up your organizing space. 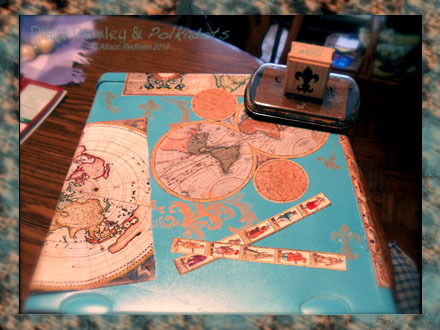 Decoupage is really about the simplest craft you can do, and depending on how dedicated you are to the project supplies can range from the simple to to the Cadillac variety. The first thing you need is a surface to decorate, and if you are using plastic like me, then I suggest priming the surface with some spray paint to even out any color changes and it also gives a texture for the adhesive to stick to. As far as decorations, really any paper product will work. I just loved the look of the antique maps so I picked up a wall calendar at an after Christmas sale at a bookstore. The next thing you need is an adhesive- diluted craft glue will work just fine, or you can pick up Modge Podge for decoupage. The method is simple but it does take some patience, something I desperately need more of in my life. Ha- maybe crafting will give me some zen. Essentially, apply a layer of adhesive to the surface and then the paper and then smooth the paper onto the surface. You will have to brandish out air bubbles as it dries and thicker paper will cause more bubbles. You can use a sponge or a Popsicle stick or even your au naturale finger to press the air out from underneath the paper. The adhesive mixture will act like a varnish to cover your project but I also covered mine with a coat of clear gloss Krylon paint spray- one of my best friends!! I wanted to add a little more design to the end product so I used some rubber stamps and gold ink. 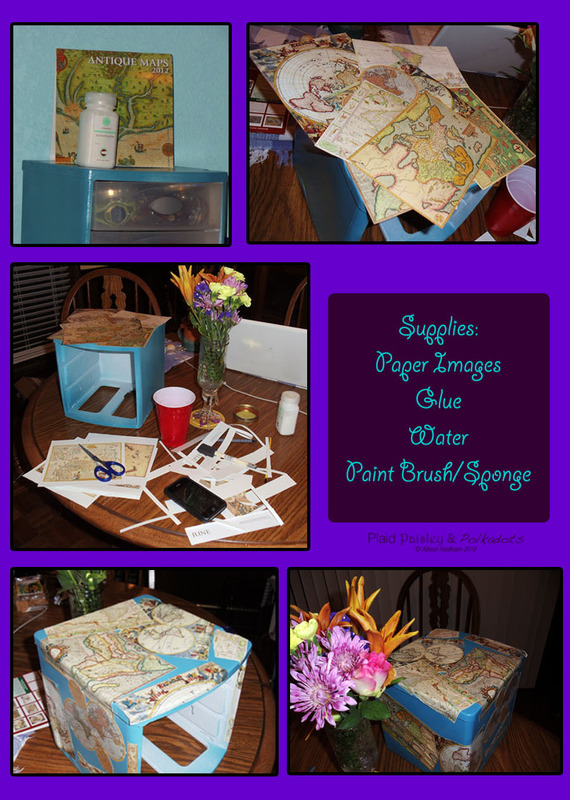 This kind of project is great for mixed media and using leftover parts from past craft projects. It is also a good way to use any “pretty paper” you might have collected along the way: cards, wrapping, scrapbook,calendars, or just about anything.